Have you ever heard the term “Mystery Babylon”? This is a common phrase used to describe a “female” entity in the book of Revelation. We know “Mystery Babylon” is “female” because she is described as the MOTHER of harlots and abominations of the earth. Revelation 17 portrays her as a “great harlot” who sits on many waters and rides a scarlet beast that is full of blasphemous names. Who or what is this woman depicted in Revelation 17 & 18? The Bible calls “her” a “mystery”, “Babylon the Great, the mother of harlots and abominations on the earth. Early in the history of humanity, as people repopulated the earth after the flood a number of people settled in the land of Shinar. Shinar is one of the cities in ancient Babylon founded by Nimrod, according to Genesis 10:9-10. In defiance of the One True God YHWH Elohim, the people conspired together, under the leadership of Noah’s wicked grandson Nimrod, to build a giant tower that reached to the Heavens. It was believed to be a Ziggarat, a pyramid whose purpose was to reach up to Heaven (stairway to Heaven). 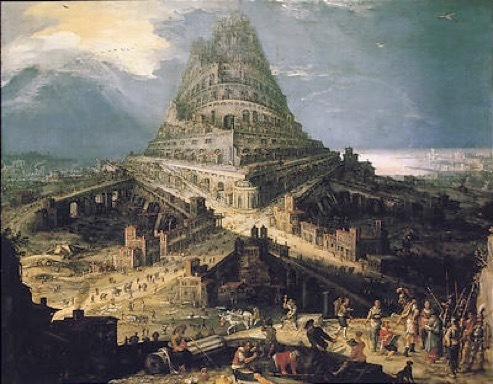 Babel represents man’s first great rebellion against God. Babylon is the most famous city from ancient Mesopotamia whose ruins lie in modern-day Iraq 59 miles (94 kilometres) southwest of Baghdad. The name is thought to derive from bav-il or bav-ilim which, in the Akkadian language of the time, meant ‘Gate of God’ or `Gate of the Gods’ and `Babylon’ coming from Greek. This ancient rebellion, the gathering together of people in defiance of YHWH to form a One World Kingdom, to create a “stairway to heaven”, seems to culminate in what YHWH calls the MYSTERY of Babylon the great, the mother of harlots and abominations on the earth (Rev. 17:5)! Where do we see the term “harlot” used in the Bible? God uses this term to describe ISRAEL. To God, Israel’s IDOLATRY is spiritual ADULTERY because Israel is MARRIED to YHWH! We know that YHWH divorced the Northern 10 Tribes of Israel (Jeremiah 3:8); however, HE is still married to the southern 2 Tribes, who also go by the name “Israel” or JUDAH. Jesus is betrothed to the Church, the Bride of Christ! In the Bible, abominations are always linked to IDOLATRY, or worship of idols, anything that is NOT YHWH Elohim. Babylon the Great, a MYSTERY, is the mother of harlots AND abominations. This Mystery that is Babylon APPEARS to be the ORIGIN for Israel and the world’s IDOLATRY, the place where it began (tower of babel) and has continued throughout the ages. There have been many theories about the identity of Mystery Babylon in Revelation 17 and 18. In-fact, there have been entire books written on this subject. Because “she” is described as a great and wealthy city, some have thought that “Mystery Babylon” is New York City. Others think “she” is America, Mecca, or the Vatican. The Vatican is probably the most popular theory because like “Mystery Babylon”, the Vatican literally sits (is surrounded by) 7 hills (mountains). Those who subscribe to this theory consider the Vatican the “mother” of harlots and her “prostitute daughters” the Protestant Churches. Although the authors of these theories make some compelling arguments, there is a problem with all of them, they are too narrow in their scope. We see in Revelation 18, that “Mystery Babylon” is being held RESPONSIBLE by YHWH for the blood of the prophets, of the Saints, and of ALL who have been slain on the earth! WOW! Mystery Babylon is being held responsible for the slain blood of Abel in the Garden of Eden!!! This can’t be America, it can’t be the Vatican, it can’t even be Islam. It’s something more ancient. I’m not saying that the Vatican and Islam aren’t a part of Mystery Babylon, but Mystery Babylon has to be something that started at the very beginning, even before the Tower of Babel. This entity (Mystery Babylon) existed at the time that Cain slayed Abel. Are we talking about the serpent, about the tree of the knowledge of good and evil? Whenever the Lord uses a similar phrase in different parts of the Bible, we need to sit up and take notice because somehow there is a “link” between the two. In Rev. 18, God is holding this “female entity” accountable for “ALL who have been slain on the earth”! Although this is shocking, it actually isn’t the first time that we see this phrase used in the Bible. In Matthew 23, Jesus exposed the “leaven” (sin) of the Pharisees (“Jewish elite”) to the crowds of Jewish people. Then, Jesus said something very sobering. He held the Scribes and the Pharisees accountable for ALL of the righteous blood shed on the earth, specifically going back to RIGHTEOUS ABEL! Jesus used almost the EXACT same phrase to describe the Pharisees of His Day to the Mystery that is Babylon the Great, the mother of harlots and abominations on the earth in Rev. 18! Matthew 23: 34 “Therefore, behold, I am sending you prophets and wise men and scribes; some of them you will kill and crucify, and some of them you will scourge in YOUR synagogues, and persecute from city to city, 35 so that upon you may fall the guilt of ALL the righteous blood shed on earth, from the blood of righteous Abel to the blood of Zechariah, the son of Berechiah, whom you murdered between the temple and the altar.36 Truly I say to you, all these things will come upon this generation. What is Jesus telling us about these pretend Jews, who are really from the Synagogue of satan (Rev. 3:9), who Jesus says are like their father, the devil (John 8:44)? Wow! Now we see this “Mystery Babylon” not only infiltrating Christianity, but prior to that, Judaism! Who are these pretend Jews from the synagogue of satan that seem to be a part of “Mystery Babylon” We’re going to go back to the days of Moses, when YHWH led His people out of Egypt. Exodus 12:38: Now the sons of Israel journeyed from Rameses to Succoth, about six hundred thousand men on foot, aside from children. 38A mixed multitude also went up with them, along with flocks and herds, a very large number of livestock. “And who were the mixed multitude? Were they Lydians, Ethiopians, or Cyprians? Were they not all Egyptians, and did they not all come from Egypt? If they had consisted of a mixture of many different nations, would not the plural verb alu (went up) have been used instead of the singular ala (Ex. 12:38)? Deuteronomy 22:11: “You shall not wear a material mixed of wool and linen together. 2 Corinthians 6:14: Do not be bound together with unbelievers; for what partnership have righteousness and lawlessness, or what fellowship has light with darkness? According to ancient Jewish writings, the Egyptian sorcerers and magicians were WITH the Israelites from the time that YHWH brought them out of Egypt (mixed multitude). Could these Egyptian magicians and sorcerers have been descendants of the Nephilim (Mixed fallen angels/human – Genesis 6)? The Nephilim were very evil hybrid beings who were present, both before and after the flood! It is thought that Nimrod of Babylon, Noah’s wicked grandson, was somehow a descendant of Nephilim. Were these “Egyptian sorcerers” the ones who BECAME “Jewish Scribes and Pharisees” who who wanted to KILL the TRUE MESSIAH, Yeshua/Jesus?? Were they the ones who say that they are Jews, but are NOT for they LIE, they are from the synagogue of satan? Jesus called them children of the devil (John 8:44)! Jesus said that they were RESPONSIBLE for ALL OF THE RIGHTEOUS SLAIN ON THE EARTH! The Hebrew word often translated ‘mighty’ (Strongs Heb number 1368) is used three times – twice in the compound ‘mighty hunter’ and once translated ‘warrior’ though many translations use the phrase ‘mighty one’. ‘The Hebrew root is commonly associated with warfare and has to do with the strength and vitality of the successful warrior’. It was used to describe the GIANT Goliath the Philistine in I Samuel 17:5 where the RSV translates it ‘champion’, and of those of David’s armies in I Chronicles 11:26-47. But, the word is used in Genesis 6:4 with the Hebrew word for ‘man‘ to describe the offspring of the illicit union between angels and women. These were the ‘mighty men’ of old. The inference here, then, is that Nimrod was regarded as being more than merely a man. His strength was seen as being greater than the offspring of a man and woman could possess. There was, it appeared, the blood of a fallen angel flowing through his veins – though I am not saying that that was definitely the case. All the way back to the days of the Exodus, in-fact, all the way back to Isaac, YHWH did NOT want His people marrying the people from the land of Canaan, who were known hybrid Nephilim. God did NOT want darkness mixing with light! It seems very possible that this “Babylonian seed”, this seed that is “Mystery Babylon”, potentially nephilim hybrid, found its way into Jewish society, having mixed with some of the Jewish people who had made Exodus out of Egypt. Jesus definitely told the “Jewish” elite who desired to kill him that they were children of the devil, and that UPON THEM, the accountability for ALL of the SLAIN ON THE EARTH would fall! Revelation 3:9: Behold, I will cause those of the synagogue of Satan, who say that they are Jews and are not, but lie— I will make them come and bow down at your feet, and make them know that I have loved you. I do not believe that “Mystery Babylon” is a literal place like Jerusalem, Mecca, New York City, America, or the Vatican. Rather, I believe that Mystery Babylon is called by that name because “her” roots can be found at the tower of Babel. Revelation 17:18 uses the word “city” as a metaphor. The Bible is a “tale of two cities” or a “tale of two seeds”. The two cities are “Jerusalem” (YHWH) and “Mystery Babylon (satan)…two cities, two seeds, good seed/bad seed. These are metaphors for the entire conflict in the Bible between the seed of the woman (JESUS CHRIST) and the seed of the devil (antichrist). Mystery Babylon is the devil’s “creation”. It’s the “evil city/bad seed/antichrist”, the OPPOSITE of the Good City/Jerusalem/Good Seed/ JESUS CHRIST. The “evil city” originated in the Garden of Eden but really gained steam and organization around the time of Nimrod and Semiramis. Although Babylon and Jerusalem are both actual cities, the terms New Jerusalem and Mystery Babylon are being used as metaphors. This is the “New Jerusalem” Vs “Mystery Babylon”/”Good Seed” vs “bad seed”. The devil created this ugly “city” which is really not an actual city, but paganism and lies. His goal is to weave this “city” as the “Mystery of Iniquity” into all religions (both ancient and modern) in order for him to be worshiped via deception. Mystery Babylon is the mother of harlots and abominations of the earth. “She” has daughters who are called harlots because they are in Covenant with YHWH, but they have allowed idolatry, paganism and lies into their worship of YHWH. These are the “tares HIDDEN amongst the wheat”, secretly weaving idolatry (paganism) in with the truth. Note that the moment Christianity was “birthed” the “Mystery of Iniquity” was already at work (2 Thess. 2:7)! Since Mystery Babylon is the mother of not only harlots but also abominations of the earth, she has “other” daughters. YHWH calls her “other daughters” “abominations” because they practice idolatry and are NOT in Covenant with Him and therefore have NO PORTION of the TRUTH. These “other daughters” include Islam, Paganism, Wicca, Budhism, Hinduism, and all other religions. Will the hidden TARES ever be EXPOSED? IS the wicked woman from Zechariah the same woman as the MYSTERIOUS Babylon the Great, the MOTHER of harlots and abominations from the book of Revelation? The prophet Zechariah is writing about this unclean woman named Wickedness who is GOING FORTH, flown by two other “unclean women” (false religions) TO the land of SHINAR where she will be set on HER OWN PEDESTAL (given her own religion). Currently, WICKEDNESS is heavily concealed by a very heavy lead lid. Storks are migratory birds that return to their “roots”. What happened in the land of Shinar? This is the place where the first rebellion against YHWH took place, the tower of Babel! The name Zechariah, means “Yah has remembered” In Revelation 18, the scripture about ‘MYSTERY BABYLON”, the voice from Heaven says “GOD HAS REMEMBERED her iniquities! Zechariah’s name means Yah Has Remembered…..Rev. 18, God has Remembered “her iniquities. Jesus told the Scribes and Pharisees they were RESPONSIBLE for all the slain on the earth! Rev. 18, the Mysterious Babylon the Great, mother of harlots and abominations is responsible for all of the slain on the earth! Jesus specifically named not only Righteous Abel as one whom the Scribes and Pharisees murdered, but also the prophet Zechariah! Zechariah prophesied that the “woman” named WICKEDNESS will be FLOWN to the land of Shinar, back to her roots, where she will be set on a Pedestal of her own. Shinar is the location of the tower of Babel, the start of the Mystery that is Babylon the Great! Although heavily concealed now, WICKEDNESS will be EXPOSED. It definitely appears that Zechariah is prophesying of 3 false religions (3 wicked/unclean “women”) coming together to form a One World Religion at the end of days. (her own pedestal). A new interfaith and spiritual gathering of Christians, Jews and Muslims will take place in Jerusalem this September (2016). 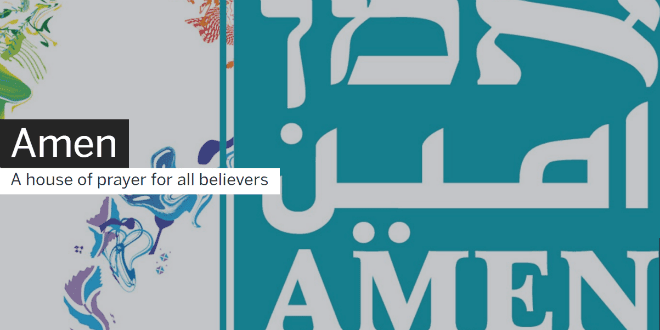 “Amen-A House of Prayer For All Believers”, part of the 2016 Mekudeshet Festival from September 4-23, is an initiative created by the Jerusalem Season of Culture, an annual festival in Jerusalem, to bring together the world’s three major faiths “who share a belief in one God and a boundless love for Jerusalem to dialogue, study, sing and pray together in one temporary house of worship,” said a press release. We will study, argue – yes, this is also allowed – and pray – together and alone. We will see if it is possible, despite all the corporeal difficulties and earthly obstacles, to create a new reality,” said Mekudeshet Artistic Director Itay Mautner. What “god” are they praying to together? Do you think people will think it’s a “good thing” to see Islam, Christianity (Catholicism) and Judaism coming together, praying together? Love is love, right? What if FIRST there was a Holy War that caused much death and destruction, would people be happy to see all of the major religions coming together to form a New World Religion? Could we already be seeing the build up to this? Doesn’t Jesus tell us that there will be GREAT DECEPTION at the time of the end, that would deceive even the very elect if that were possible (Matthew 24:24)? Notice the similarities. Are they looking for something? ?